If your looking for a fun and easy party favor for your child party (or even adults) here's one I've done a few times and it's been a HIT. Such a hit, boy wonder just went to a birthday party a received one as a favor (the one in the middle). To do: Pick up your CD's and cases at your local super center and while there pick up the Avery CD labels (the step by step directions are in there and a breeze to follow). Then head to the computer and with your child's help and look for your songs. Itunes is the easy to use and a wonderful resource. Head there and follow the directions. Once your done you can burn your extra CD's for your party favors. Then make your Avery labels, using clipart or photos for decorating the labels. 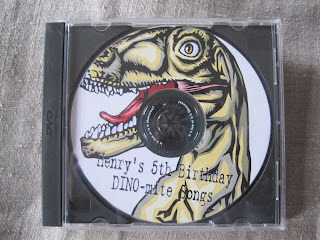 Don't forget to make a list of the songs and add a label to the back of the CD case. 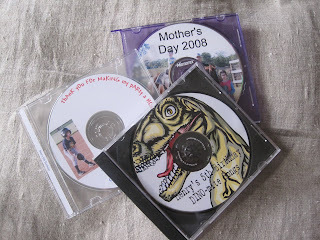 I have done these for Christmas, birthday's and my husband and children even made me one for Mother' day one year. Good Luck, email if you have any questions.